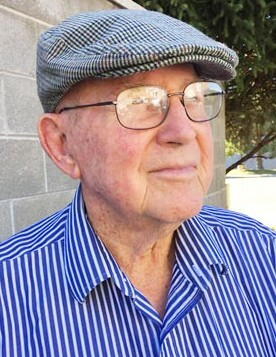 Richard McKee "Critch" Bean, age 96, at long last embraced his sweetheart Jane Kay Bean, April 2, 2019 while convalescing in the Central Utah Veterans Home in Payson, Utah. Jane had preceded him in death by 11 years. He was born in Richfield, Utah on September 22, 1922 to Isaac Wall "Ike" Bean and Hattie Selena Bartlett Bean. Critch was the last of their 6 children. He had a lifelong love of hunting and of guns, and became quite adept at turning a piece of wood and a barrel and action into beautiful and accurate rifles. Critch was active in a black powder club, the Utahah Frontiersmen He taught hunter safety for many years. He loved the Boy Scouts of America and served as Scoutmaster for a number of years, often camping with the troop in a large teepee he had fabricated. Critch was an active ham operator, for more than 60 years, with the callsign K7MOC. He participated in several preparedness ‘nets’ each week on the radio. Critch served during WWII aboard the Marine Corps aircraft carrier “USS Gilbert Islands” (CVE 107) as an airplane mechanic and squad leader in the Pacific theater. He rose to the rank of Tech Sergeant, and counted his military service as very formative and precious. Critch married Jane Kay of Annabella, the love of his life April 13, 1947 in Las Vegas, NV. The marriage was later solemnized in the Manti Temple of the Church of Jesus Christ of Latter-day Saints. They and a group of dear friends would often date together, meeting at Fish Lake Lodge for dancing, and then recite poetry by moonlight, each man having memorized part or all of a ‘romantic’ poem, such as “The Cremation of Sam McGee,” or “The Song of Hiawatha.” The poetry must have worked its magic, because 3 of the 4 couples married the same day in Las Vegas. Critch served faithfully in the Church of Jesus Christ of Latter-day Saints in a variety of callings and assignments until the effects of advancing age, and deafness, became too challenging. He and Jane served together as ordinance workers in the Manti Temple and as missionaries, both locally and to the good people of Galion, Ohio while serving in the Ohio Columbus Mission. They loved their neighbors, friends, and family, and seemed to be everyone's grandparents. Critch retired after 35+ years from the "telephone company" (MST&T and Mountain Bell), after which he filled his time with gardening; hunting; family events; ward, stake and mission functions; neighborly things; and eventually caring for Jane in her twilight years. He felt great joy in reading scripture and learning of his Savior, and in sharing his testimony. Critch was preceded in death by his parents, his 4 sisters and elder brother, his angel wife, and 2 grandsons. He is survived by all 7 children: Rex (Kae) Bean, Virginia (Richard) Power, James (Cathy) Bean, Valerie (Tracy) Johnson, Julie Burgess, David (Cheri) Bean, and Jeffery (Denise) Bean; 33 grandchildren, 44 great grandchildren, and 2 great-great grandchildren.